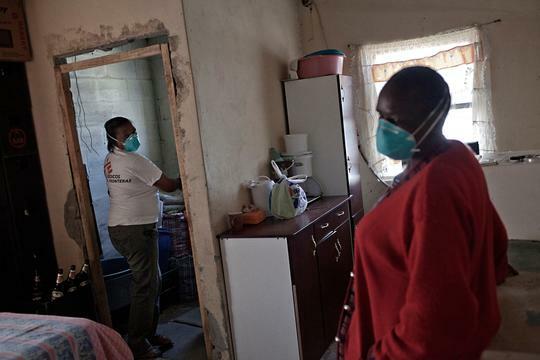 XDR-TB survivor and peer counselor, Xoliswa Hermanus, inspects the family home of Jonas Cikizwa (right); a woman infected with extremely drug-resistant tuberculosis (XDR-TB), HIV and diabetes. Khayelitsha township, near Cape Town, South Africa. In places with high HIV or tuberculosis (TB) burdens and significant shortages of human resources for health care work, lay counsellors have become extremely important. They provide HIV testing and counselling and help patients get through difficult challenges in adhering to HIV and TB treatments. But their crucial involvement in treatment programs is critically underfunded. Doctors Without Borders/Médecins Sans Frontières (MSF) recently released a report that illustrates this disconnect. The following testimonies of patients and lay counsellors themselves also show why this work force needs to be better integrated into HIV and TB treatment programs. "My husband died because of our mutual ignorance about HIV. "In 2007 he was successfully treated for TB, only to fall sick again a year after. He had all his HIV test results but he always refused to take ARVs. I would accompany him to buy all sorts of health supplements and herbal concoctions, none of which worked, of course. It was only much later when I started working as a counsellor that I looked at his medical documents and understood what could have been done to save him. But by then it was too late, he was already dead. I felt so bad when I realised he could still be with me, if only we had information and someone to provide medical guidance and support at the time. "I'm HIV-positive too and, like my husband, I also went through a serious case of denial – so much so that I infected my child. I was so stubborn and against medical advice, I continued to breast feed. In the process I infected my baby. This is what I always tell people. I tell them about how denial cost me my family. "Until today I have not told my son that he is HIV-positive. He is seven years old, but still does not know. Sometimes when I look at him I am overwhelmed by guilt and sadness that I did this to him. But in due time, when he is able to understand, I will tell him. I k;now how important it is: continuously advise people to disclose their children's status to them. But I also know how difficult and painful it is. “It was not easy when I was diagnosed with XDR-TB: the nurse didn’t even explain to me what was going on. I was so scared, I thought I was going to die. But when Buci, a DR-TB counsellor, came the following morning, she explained to me what this XDR-TB meant. That made me feel a little better. It happened more than once that nurses refused to give me my treatment or listen to my story. That’s when I would call Buci again, and she would come to fight for me. My family lives far away, so Buci played a big role in my recovery: she was my friend, my family, everything. 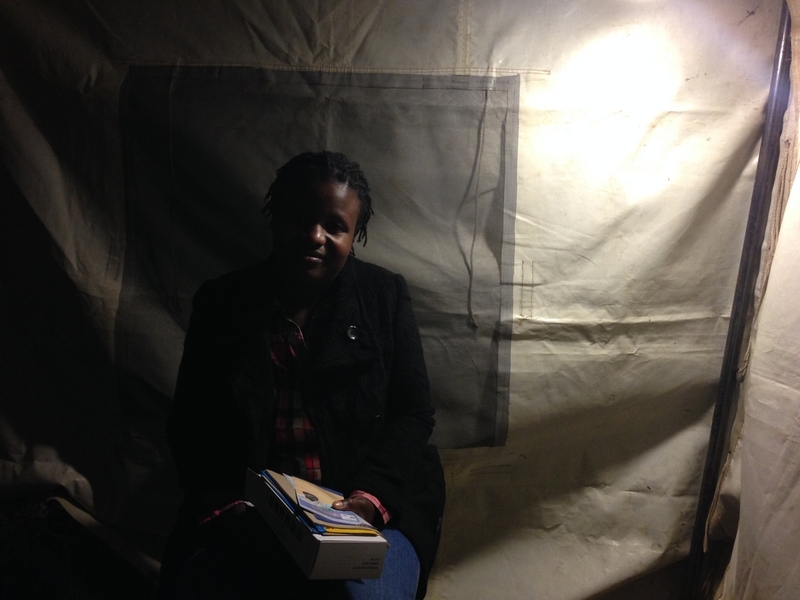 “It’s challenging to provide counselling in the night clinics that provide HIV-testing. The vast majority of people we see are men. Sometimes they shout at me, or become aggressive. But, despite that, the service provided in the night clinic is crucial. Many men don't want to go to health centres, so we go to meet them wherever they are. “When I was told I was HIV-positive, I was very worried. I thought; ‘How am I going to tell my husband about this? What if he tells me this is the end of our marriage? How do I present condoms to him?’ I had great fear, for me and for my unborn child. But then I was in contact with the peer mothers. They were the ones who gave me thorough counselling. They told me, ‘You don’t have to be afraid. There’s a program that helps mothers to prevent infecting their unborn babies.’ They told me it works, so I believed them. 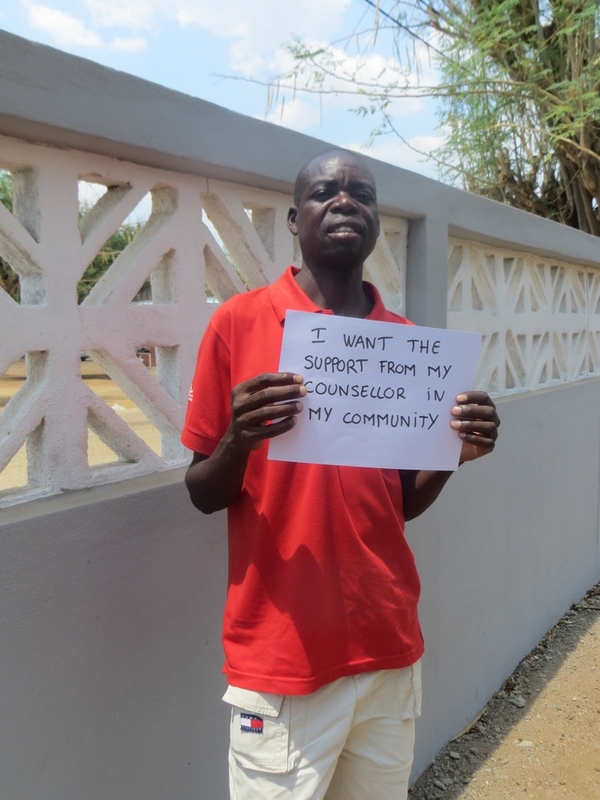 "I like my counsellor because he is giving professional advices to be adherent to my treatment and help us to plan our treatment"—Raul Mwandibozar, from Changara, Tete province, Mozambique. Raul learned he was HIV-positive in 2008 and now he, his wife, and his daughter are all on treatment. He is the focal point of a Community ART group (CAG) where groups of six people living with HIV organize themselves to better access their medicines. The CAG group helps lots at exchanging information about the disease, to remember the dates to pick up the medicines at the health center and to share the costs for transports at the health center.